Torco Motorcycle Transmission Fluids are a series of light viscosity gear fluids specifically formulated for 2 stroke and 4 stroke wet clutch transmissions. 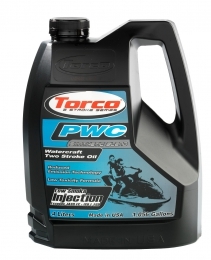 Torco PWC is a superior blend of smokeless synthetic base oils, petroleum base oils and low ash additives designed for high output personal watercraft engines. Offers lower emissions, superior engine protection and improved throttle response. Torco Racing Fork Fluid is a series of high VI synthetic blend fluids designed to exceed the demands of all cartridge and damper rod applications. Maintains viscosity providing consistent damping under the most severe temperature conditions. Torco T-2R High Performance 2-Stroke Oil is designed for today's High Performance Recreational Machines. T-2R's well-balanced blend of smokeless synthetic and highly refined petroleum base oils provides extra wear protection, "ultra clean" performance, enhanced throttle response and increased horsepower. Torco T-4 is a highly refined petroleum blend lubricant designed specifically for motorcycle engines. Utilising an exclusive blend of additives and polymer systems that resist high shock loads, high temperatures, shearing and eliminates deposits. T-4 is formulated to remain stable under peak operating temperatures and provide excellent protection for integrated transmissions. Torco T-4MXR is a blend of specially selected synthetic and petroleum base oils for off road four stroke racing engines. This Semi-Synthetic oil provides the highest degree of protection under extreme temperatures, severe shock loads and peak RPMs.